1. Make sure you take your medications as prescribed. 2. Call your doctor and see if there is anything else you can be doing. 3. Make sure you get sleep every night. 4. Let your support system know you are having trouble. 5. Lay low and try to minimize the things you do even though your mania energy wants to save the world. 6. Don’t write any letters or make phone calls that you will regret later. 9. Eat right- You often lose your appetite or are so busy that you forget to eat. However, make sure you eat. 10. Eating foods high in protein helps. 11. Play an instrument, draw, paint, participate in your favorite hobby. 12. Use breathing exercises, pray, or meditate to help you relax. 14. Remember- Things will get better. 15. Remember- Usually the longer you are “high” the lower your low will get. Do everything in your power to prevent sinking into a depression. 17. 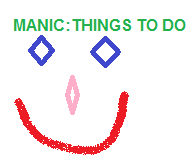 Please feel free to add more things you do while manic that help. This entry was posted in Uncategorized and tagged bipolar disorder, manic. Bookmark the permalink. Very nice and concise. All good suggestions.